The rent in San Francisco is too damn high. That's a given. And thanks to a new map by real estate listings site Zumper, we can see just how stupidly high rent prices are in neighborhoods across the city, and -- surprise! -- it ain't pretty. 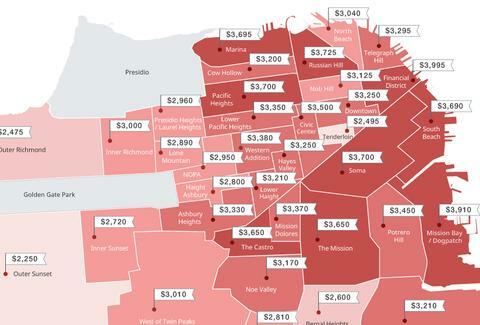 The map (embedded below), shows the median rent for a 1 bedroom apartment in several San Francisco neighborhoods based on Zumper's data from May. Neighborhoods on the east side of the city saw the highest prices, like the Financial District ($3,995), Mission Bay ($3,910), and SoMa ($3,700), while outer neighborhoods like Outer Sunset and Bernal Heights saw better deals. Well, relatively better deals. Oh, and just when you thought the neighborhood price breakdown was horrific, the city's overall median rent will further crush your dreams. 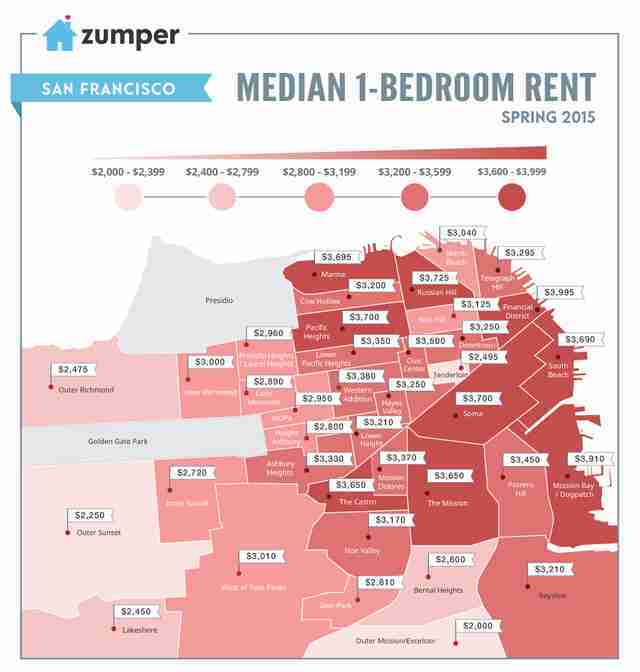 Specifically, the median rent for a 1 bedroom in May hit a new record (according to Zumper's data) at a whopping $3,500, or up 1.2%, handily securing San Francisco's spot as the No. 1 most expensive rental market in the country. That's $400 more than the median rent in New York City, the second most expensive rental market, according to the site's National Rent Report. Damn. Note: Zumper's median is considerably lower than the $4,225 median reported by another listings site, Zillow, but it's still too damn high. Tony Merevick is Cities News Editor at Thrillist and, after seeing this, thinks his NYC apartment hunt could be much worse... Send news tips to news@thrillist.com and follow him on Twitter @tonymerevick.